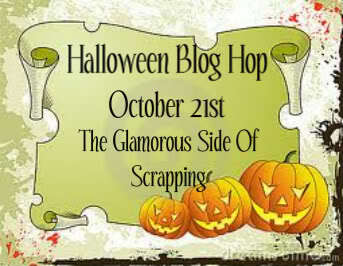 Welcome to the Halloween Blog Hop hosted by Ashley. You should be arriving here from Ellen's blog. The complete hop lineup is at the end of this post. Winners will be announced on Monday, October 24th. I created a digital layout using the My Memories Suite scrapbooking software. I am not affiliated with this company. I just LOVE their program! 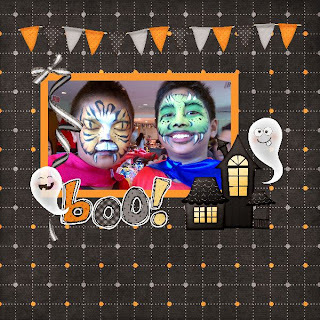 I used a Halloween digital kit called Boo! available from Sweet Shoppe Designs. This kit is too cute! I love the cute little ghosts and the haunted house. Thanks so much for stopping by. Please hop on over to Zenita's blog next! OOOH, what a spooktacular layout, Dena!!! I've just gotten My Memories software and haven't had a chance to play with it yet. You've given me perfect inspiration! Thank you. LOVE your layout!!!!!!! love this, are those your boys? Adorable!!! great digi lo! love the kids facepaint! What an awesome page. I've been checking out that software and I've been debating on getting it. You inspired me to check it out.Thank you so much for being apart of the hop. great Digi Layout! I am a follower here already! I don't know who did their makeup but they did a fantastic job! Very nice layout! love the layout! those little ghost are so cute. I love the paper!! The layout is wonderful, of course the paited faces are so cute too!! I really like your digi layout! The picture is really cute! Great layout. Love the picture too. Love your layout, very creative! Very cute digital layout! Thanks for sharing! Perfect layout for that delightful photo. I am now a follower of your blog. So very nice to meet you. Please stop over to my blog sometime and give me a shout out! Cute layout!!! i like the elements!! So cute!!! I love how you did digital. I haven't tried any digital yet but really like the looks!! Miss Dena, you are my idol :D I love what you are doing with this software and the pic is FABULOUS! So glad to see you in this hop. Awesome layout Dena! I love that black and white background! That pictured is wicked - who painted those amazing faces? Great LO! Love the face paint too. Great layout what a cute picture very spooky! You did an amazing job on the layout. Isn't it a lot of fun doing digital sometimes. Thank you for being a part of this hop and sharing your wonderful project with us all. Cute layout! I keep hearing about this software and seeing new projects -- may have to look into it myself. TFS. I'm a new follower. Very cute layout! I love those masks!